Perhaps you learned it the first time you traveled with a significant other: some people are planners, and some people don’t plan past lunch. The problem with being in the second group -- at least if you enjoy traveling -- is that without anybody to sort out the trip details, you don't go anywhere! Assuming you're totally cool with trusting a total stranger to choose where the hell you travel, Pack Up + Go is a website that plans mystery weekend getaways based entirely on your budget and a list of interests. And the big catch: you have NO IDEA WHERE YOU ARE GOING! First, Pack Up + Go asks you to select your preferred mode of transportation and budget: Road Trip (between $350-$2,000) or Fly/Bus/Train ($450-$2,000). 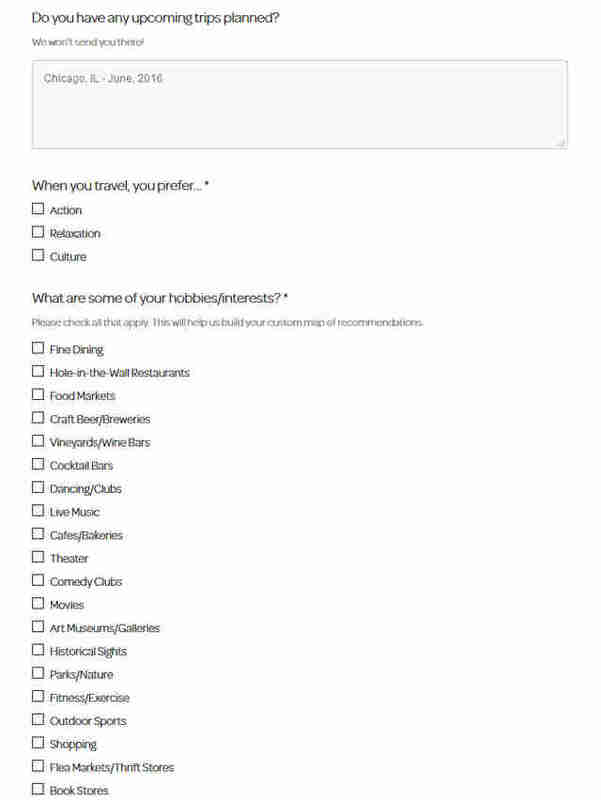 From there, you fill out a survey with your basic information and details like "where you’ve traveled before" and "what you like to do." This ensures you don’t get sent BACK to Sioux Falls for a second straight month (even though Sioux Falls is fantastic) or receive a list of art museums to visit when all you really want to do is scuba dive. It also asks for your schedule flexibility (like, if you can’t leave before you’re out of work on Friday), dietary restrictions, and if you’ll be bringing kids. Then comes the fun part. You’re given a list of 22 activities and asked to select those that interest you; the more you pick, the more recommendations they provide. Also, you pay! And it's NON-REFUNDABLE, so choose carefully. Is that when things get all Mission: Impossible? Yes, yes it is. Well, sort of. Shortly after you finalize your online transaction, you’ll receive a mysterious envelope in the mail with all of your travel/hotel confirmations. Should you choose to accept the mission -- and why not since, like, you've already paid -- you'll stare at said envelope (dying of curiosity) until the day of your trip. Or, if you’re the type who opened your Christmas presents on December 20th then you've probably already opened it and ruined the surprise. Sooooo, where're you going? About a week before the trip, you’ll receive an email with your destination's weather forecast destination (but still without revealing the location), a recommended packing list, and a time and place to be if you opted to fly/bus/train. For example, the email would read: “Be at Ft. Lauderdale Airport at 10am, Friday April 15." Whether the email self destructs is anybody's guess. We don't believe it does. Finally, the big day is here. You go to the appointed place, rip open your envelope, and find out where you’re going! And your immediate reaction is either: "Holy crap, this is gonna be awesome!" or "WTF... do I have to get on that plane?" Pack Up + Go's envelope also includes a curated list of recommendations (from locals) for must-hit bars, restaurants, breweries, museums, activities, etc., although they don't go as far as scheduling everything out, that's up to you. But hey, having a set list of great places is at least better than arguing for an hour while you research best bagel shops on Yelp!. So, how far away will I be traveling? Every destination is within 3-4 hours, depending on the transportation you select. 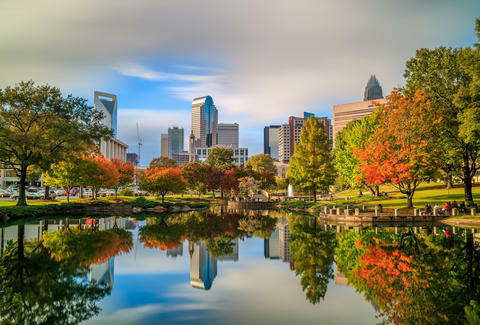 And all destinations are within the contiguous United States, so you don’t have to worry about passports, language barriers, or ridiculous phone bills. What happens if I'm sent somewhere terrible? Pack Up + Go lives by the philosophy that everywhere can be fun for a weekend, and gives you the best recommendations in even seemingly dull places. That said (again), you DO NOT get a refund if your exciting weekend lands you to Yuma. This program is for adventurous people who like to explore under-the-radar spots and discover new places. What if I'm meeting up with people from other cities? Pack Up + Go helps avoid the logistical nightmare of a trip-planning group text by allowing you to enter the info for every traveler in your group, and then handling the rest. Just remember... your budget will be the same, so traveling with someone who can only fly out of a tiny airport might make things tricky. And finally, what's actually included in the rate? Your airfare and accommodations. That's it. While Pack Up + Go provides stellar recommendations, where you go and how much you spend is up to you. Matt Meltzer is a staff writer with Thrillist who actually once had a great weekend in Yuma. Follow him @meltrez1.